“The Whistle” is an episode about employment, and what a job reveals about a person’s character and the world at large. In the eyes of the enigmatic Quentin — who relays to Emmett the story of his father, a porter for the Elgin, Joliet and Eastern Railway Company who was struck by a train and murdered on the job — those revelations are practically an origin story. It was his father’s dedicated service to the railway company that allowed his family a bit of upward mobility: Upon his death, the man’s family was given $500 in remuneration and his porter whistle. The tale is an encapsulation of what Quentin sees as the thankless, futile nature of corporate employment and class aspirations, and it is a nice peek into the mind of a character who has not revealed much of himself so far. Quentin had fallen into the role of bitter, straw-hat toting old-timer, a symbol of the old guard of kingpins who hold staunch ideas about honor and decency in their varied fields. This is a bit we’ve seen in many stories before The Chi, and his calls to a long-expired street code of conduct of course rang hollow: He did, after all, kill an entire room of Reg and Trice’s accomplices in last week’s episode. Exhausted of options and struggling to pay for his son’s day care, Emmett falls into being Quentin’s accomplice. Their first stop is turning in the guns stolen from Trice’s men. But when Quentin turns in literal boxes filled with semiautomatic weapons, the on-duty officers barely grill him. Wouldn’t the cops have at least questioned him? The repartee between Emmett and Quentin falls into a pleasant rhythm in these scenes, with the older man looking out for the younger one. 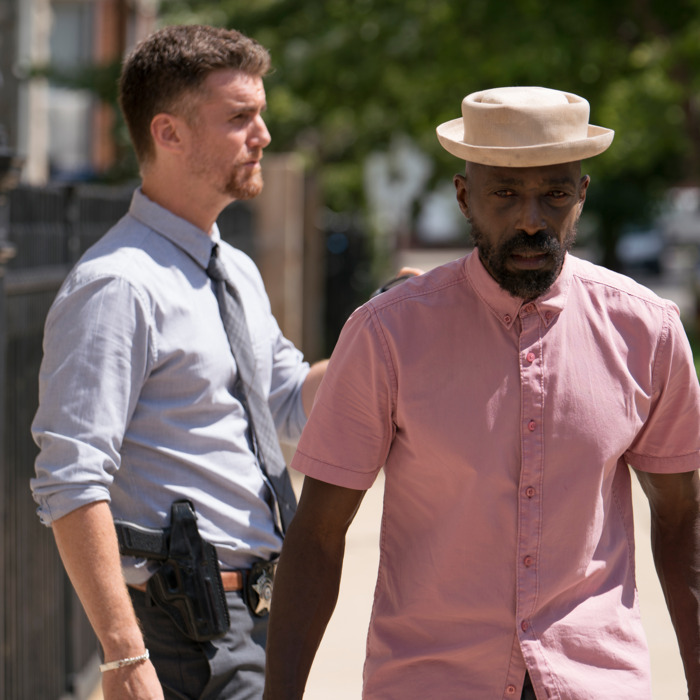 And like it or not, their partnership looks set to continue in future episodes: Emmett’s mother loses her job for stealing medical supplies to patch up Ronnie’s gunshot wound, so at least for now, Emmett’s income will be the only one in the household. As we know, Quentin was able to rob and murder Trice’s men because Reg was off his post, fooling around with a girl. It’s a decision Reg pays dearly for, with Trice showing up to his apartment to drink his fruit juice and pummel him. When Trice threatens him in his kitchen, Reg displays an emotion beyond contempt for the first time; he finally seems more than a stock character, more than the violent, mindless dealer we’ve seen again and again. As the beating goes on, the camera stays focused on Reg’s disfigured, bloody face for what feels like an unnecessary amount of time. The scene is a little bit nauseating, a reminder that The Chi is a show claiming to “humanize” a demographic that it constantly abuses. At the gun turn-in, Tracy stumbles onto a meeting for grieving mothers, held inside of a community center. One of them expresses her anger that Tracy’s son, a star athlete and A student, was granted news coverage and a commemorative mural while her son was not. The scene is a painful reminder of the community of families, lots of them women, who constantly deal with the aftermath of gun violence. Much like last week’s depiction of Jada masturbating in the tub, it is a rare chance to see The Chi’s female characters spend time with themselves. But it’s far from enough. It’s simply too hard to gleam an idea of the inner workings of their lives when they just aren’t granted the space. Later, Ronnie accosts Tracy, who insults him, per usual. She has not said a kind word to him in at least four episodes. This time, she tells him that Jason had no desire to be in his life. “The Whistle” intends this to be a testament to her bitchiness, but it really makes Ronnie seem as if he has no respect for the boundaries and wishes of a woman grieving her son. Again, we would have a better sense of her feelings if we spent more time with her. Meanwhile, Brandon quits his job because he doesn’t want to snitch on a fellow employee. This is a decision that makes no sense: Previously, Brandon’s employment at the West Loop eatery was an indicator of the chasm between himself and his family. He was a do-gooder, employed in an industry which they didn’t really understand. His job as a chef was used to indicate both his ambitions and his family’s confusion about that desire. The idea that he’d quit his job because he didn’t want to “snitch” is so juvenile and implausible that I’m guessing one of his bosses will reach out and offer his position back to him soon. (Also, I’m sure the employee still lost his job.) For now, Brandon heads back to Jerrika, who is still hesitant to allow him in her house. Week after week, one of the pitfalls of The Chi’s bloated cast is that there simply is no room for all of them. The previous episode neglected the younger boys, so when they’re reintroduced in “The Whistle,” it’s a task to kickstart their respective story lines. Aside from the issue of time, it just feels like too much has happened — especially to Kevin and Jake — to jump back into regular childhood activities like a skate party. The show is attempting a realistic, verisimilitudinous approach to the boys’ lives, demonstrating how some children are forced to deal with adult traumas during their adolescence. Jake carries a gun now, with a scowl and a necklace just like his older brother. Kevin shot a man three weeks ago. And yet, Kevin is still a little boy with a crush on a girl he wants to skate with. It’s a jarring return to a false normalcy.